471 pages with errata, diagrams, and Christmas greetings tipped in. 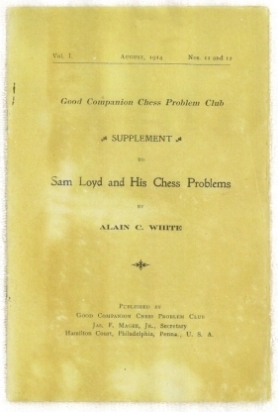 Included Supplement to Sam Loyd and his Chess Problems, Good Companion Chess Problem Club Volume 1, numbers 11 and 12 (12 pages with diagrams and photograph). Royal octavo (9 3/4" x 6 1/2") issued in red cloth with gilt lettering to cover and spine. Supplement issued in wrappers. (Betts: 33-50; 33-51 1st editions. The work contains 714 of Loyd's problems, with 30 by his brothers. The problems are arranged in three sections, following closely the plan indicated by Loyd before his death for his proposed revision of Chess Strategy. 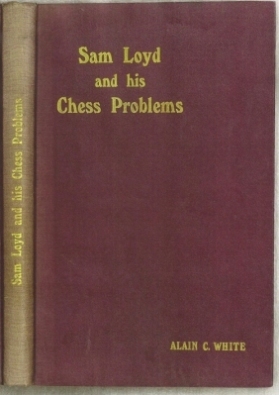 The first 136 accompany the section "Sam Loyd", which comprises a biography with details of his chess activities, and anecdotes by and bout him. 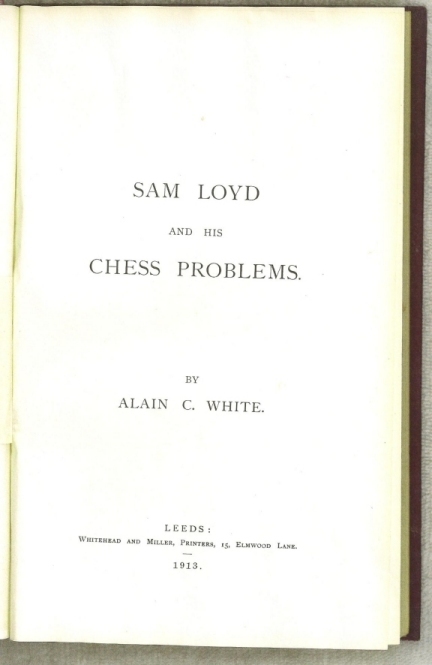 The second section contains 505 problems accompanying extracts from, and commentary on, "Chess Strategy". the final section is "Miscellanies", with unusual problems, oddities of various kinds, and problems by his brothers, all accompanied by commentary by the editor and quotation from Loyd. Supplement contains a short bio of Loyd and extensive errata to the main work. Spine sunned, some offset darkening to end papers. Supplement age darkened else a very good set with the scarce supplement.